Propulsion two 2,880bhp Hooven-Owen-Rentschler R-99DA diesel engines (Serial No. 6684 and 6685), Westinghouse single reduction gear, two shafts. PC 577 performed several duties when assigned to the Fourth Fleet South Atlantic Recife Brazil. 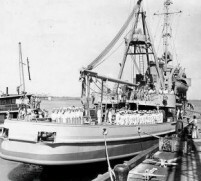 USS PC-577 picked up 46 survivors from the American merchant Birmingham City that was torpedoed and sunk by the German submarine U-124 about 50 nautical miles north of Paramaribo, Suriname in position 07º23'N 55º48'W. PC-577 also picks up 24 survivors from the American tanker Broad Arrow that also was torpedoed and sunk by the German submarine U-124 about 50 nautical miles north of Paramaribo, Suriname in position 07º35'N 55º45'W. USS PC-577 picks up survivors from the American merchants Collingsworth (34 survivors) and Minotaur (46 survivors) that were torpedoed and sunk by the German submarine U-124 about 50 nautical miles north of Paramaribo, Suriname in position 07º12'N, 55º37'W.